The Lexington Penthouse. 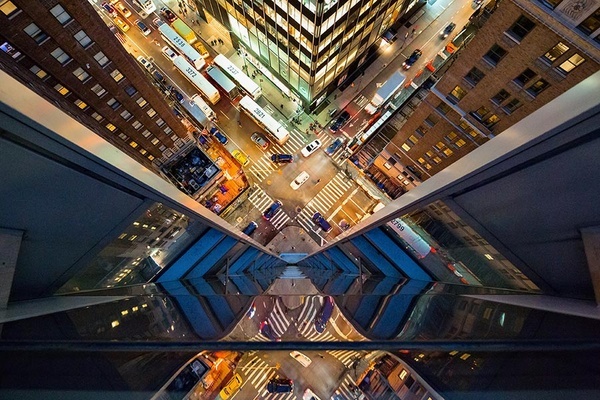 Photo courtesy of Hotel 48Lex. 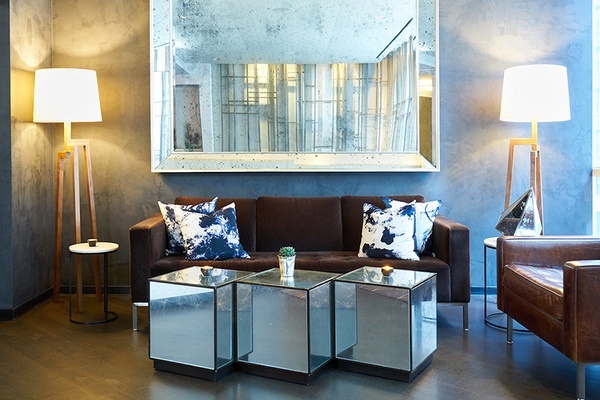 In Midtown East, a neighborhood known for its sky-high buildings, bustling streets, and general lack of charm, Hotel 48Lex is a refreshingly unpretentious-yet-sophisticated boutique hotel with the comforts of home and the convenience of a prime New York City address for a shockingly affordable price. 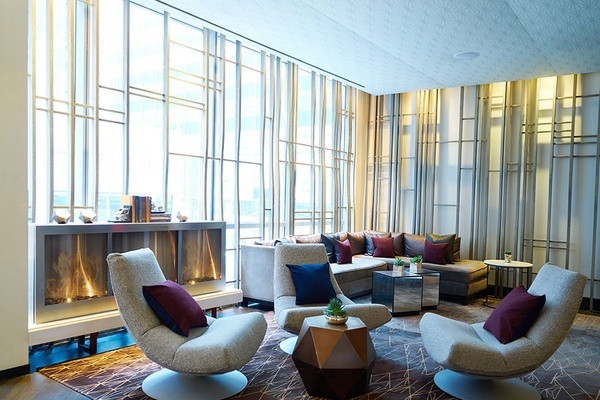 Vibe: A sleek and modern retreat that caters to travelers who want a home away from home. 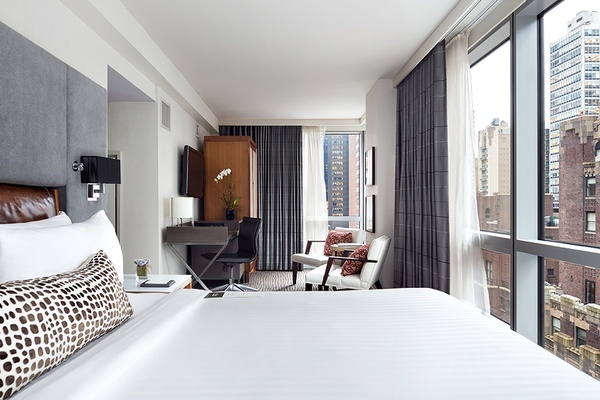 This Place Is Perfect For: Business or extended-stay travelers looking for a discreet and calming atmosphere in the chaos of midtown Manhattan. Rooms: 116 spacious pied-à-terre-style salons and suites, including two penthouse apartments that can be combined to create a grand full-floor apartment. 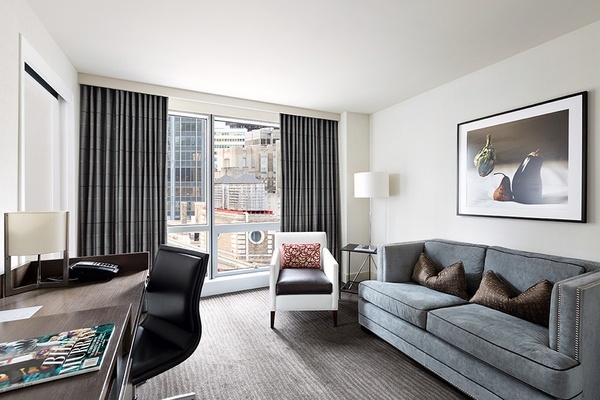 Guest rooms have elegant Spanish marble, floor-to-ceiling windows, personal kitchenettes with Fisher Paykel drawer dishwashers, snacks from Dean & DeLuca, toiletries from Beekman 1802, and free WiFi. Small dogs are welcome for an additional charge. What's on Site: Modern business center with printing services, presentation equipment, stylish event spaces and meeting rooms, and a 24-hour gym. Food + Drink: The lounge is stocked with a full bar and light bites that change according to the time of day. The first floor houses a 100-seat bistro that also delivers room service. 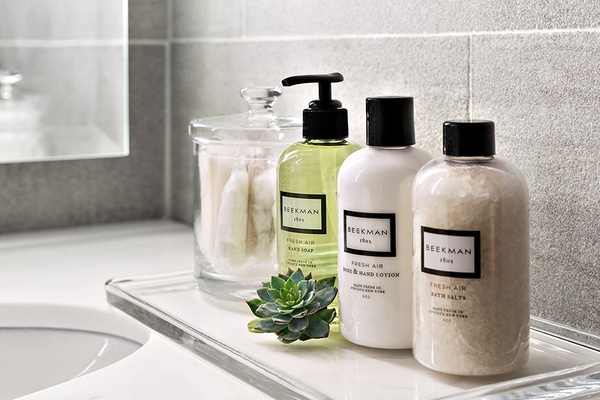 When the comforts of home are an airplane ride away, small details like toiletries made in upstate New York and natural light are what make a hotel feel warm and welcoming. 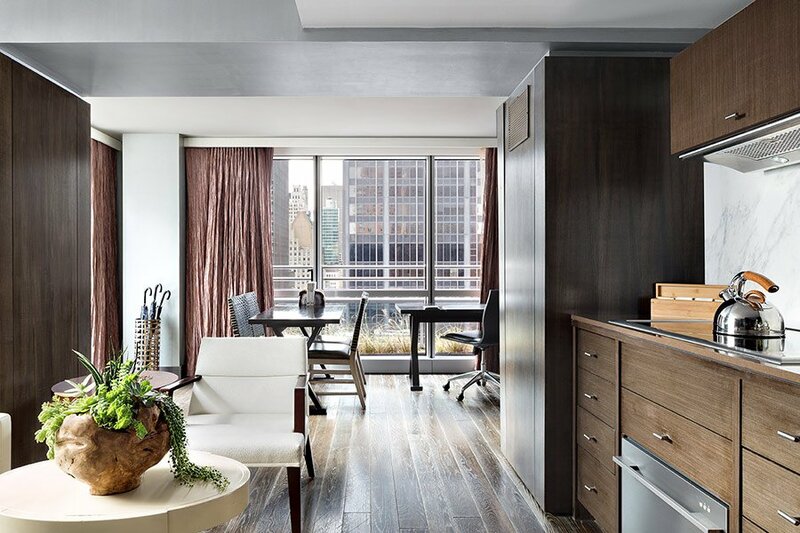 Designed to resemble a Park Avenue-style apartment, the guest rooms at 48Lex are decorated in a neutral color palette with warm, high-design accents, floor-to-ceiling windows, plush bedding, and butler pantries stocked with gourmet snacks. It's like you're staying at the home of a really fancy friend, but don't have to take off your shoes when you walk through the front door. When it comes to outdoor space and a good view of the city, you'll be hard pressed to find another hotel with ten guest rooms that offer terraces. The two penthouses each claim one, while the other eight are paired with guest rooms on the fourth floor. A mere seven minutes by foot from Grand Central Terminal, the hotel's location can't be beat when it comes to visiting classic New York City institutions. Stop by the New York Public Library for a photo op between the lions, or check out the latest exhibit at The Museum of Modern Art. Radio City Music Hall, Rockefeller Center, and Fifth Avenue's big boutiques make for easy strolling out of the gate. There's no shortage of delicious meals in New York City, like an oyster pan roast at the iconic Grand Central Oyster Bar. Follow it with a slice of Lady M's signature mille crepe cake and you'll never want to go home. For a little taste of a bygone era, head to the always impressive King Cole Bar at the St. Regis Hotel for a nightcap.